Hi All. For any of you local Bay Area types or those that might be in San Francisco this weekend...have I got a show for YOU!! 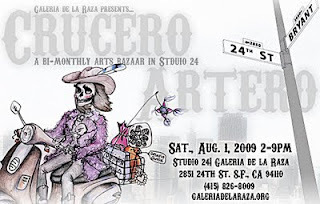 This Saturday, August 1st, come join me and several other artists, crafters selling at the Art Bazaar at Galeria de la Raza. There will be jewelry, folk art, clothing PLUS DJ Chango Julius playing music , live silk-screening by Jesus Baraza and tasty libations! A good time to be had by all! 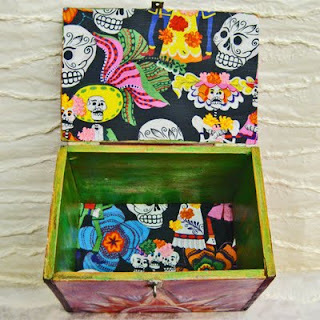 Just posted a new upcycled treasure box with the image of La Catrina on top. On the sides are hand painted rising sun, pyramid and nopal plant. 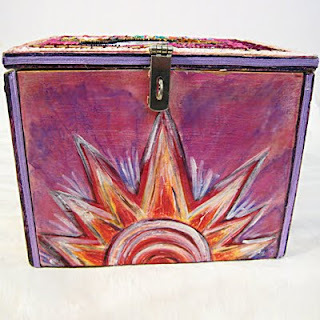 A great storage box now available on Etsy! Hi Again. 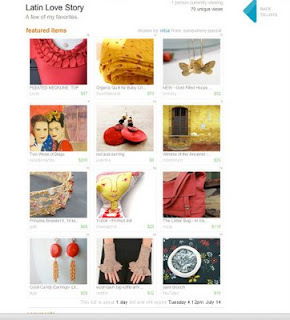 I thought that was it for Saturday but I just found two Etsy treasuries with my work featured. 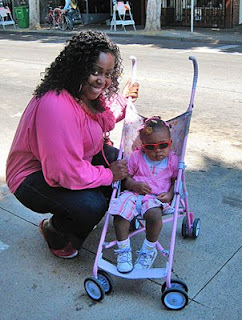 Wow....always grateful and always ready to post their pics on the blogga. 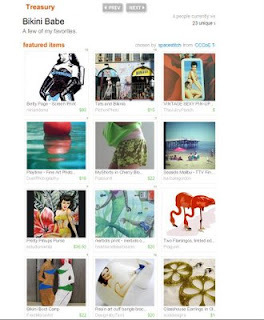 Many thanks to Liane from Spacestich on Etsy and fellow CCCOE member, who created the Bikini Babe treasury. 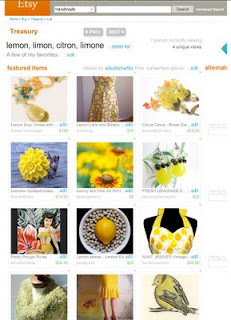 Also many thanks to Alaina of Piruli Jewelry a fellow Spanglish member on Etsy for creating the Verano = Summer Treasury. 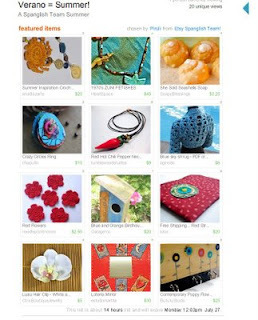 I am very, very grateful to both artists for including me in their treasury themes. OH and by the way, the first treasury has my upcycled handbag with a pin-up girl in yellow swimsuit on the front. 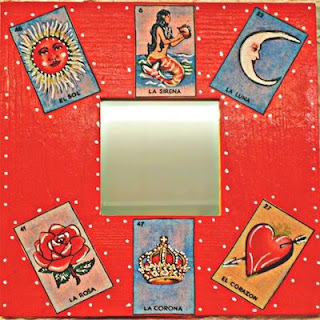 The second has my Loteria Mirror. Forgot to mention that. WOW...its already Saturday and where did the time go? I know, everyone says that but honestly sometimes it feels like you wake up one morning, its Monday and the next morning its Saturday! My fabulous, photographer friend, Trish Tunney, from 1890 Bryant Studios is having a show at the Tedda Hughes Gallery tonight. She is going to be presenting some limited edition greeting card packs made from her Faux-laroid series. Along with showing some of her framed photos, there will be live performances, drag shows and fire twirling, at the gallery during the opening night reception entitled "Flaming Queens". Oooooo. this sounds like fun! Been working on a found, recycled, redwood, window frame. It was given to me by a fellow artist at 1890. 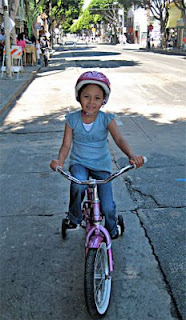 She found the frame at a soon to be demolished neighborhood in the Hunter's Point area of San Francisco. The funny thing about this frame is the shape is assymetrical. Don't know why this house need a crooked window frame but there it is. I've been sanding and staining the piece but without loosing its "found" look. 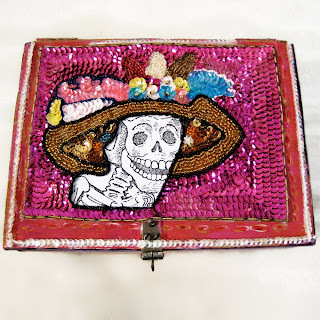 I've embellished it with santos / saints that are charms, or from small prayer books or postcards. I decided to name the piece, "Saints need Sinners" which is a quote from British philosopher, writer Alan W. Watts (January 6 1915 - Novemeber 16 1973.) 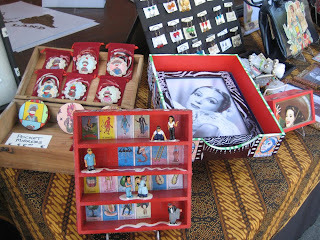 The piece - what should I call it - an updated retablo? - is almost finished. I will be taking pictures shortly. I've never done anything like this before and am secretly (except I'm telling only YOU) an excited about my finished work. Had an absolutely fabulous afternoon break with fellow artist and incredible wireist, Diane Komater. She made me a fabulous cup of hot chocolate while she drank tea and we talked about her family history, my family history our Dads and on and on. It was such a relaxing time filled with laughs, a little heartache and just good, good times. I loved it. I felt like all the cob webs in my brain had been cleared out! Diane is such a talented artist. Her hands create wonderous images with wire. You must check out her web site. Anyway, after our talk, we both thanked each other for the good, good talk and went back to work. It was a great time. So, that's my Saturday blog to you all. I have a trip planned to lovely New Orleans in early September. Can't afford it but going anyway with my daughter Gaby. She wants to attend the University of New Orleans in the Spring of 2010. It will be a great excuse to return to my favorite city NOLA. My husband is calling me. We have to give our very SENIOR dogga (dog in MY Spanglish) a bath. This can be difficult since she has very little control left of her bladder and bowels. That's probably enough details on that. Anyway, Kodi is a wonderful, sweet and tired old thing that continues to hang on even though she slows down every day. She is well loved in this family. I've been interviewed on My Shopping Connection!!! Well after just posting my pitiful need for a pity party, I received this email from Erika Pitera, editor of My Shopping Connection in Orlando Florida. 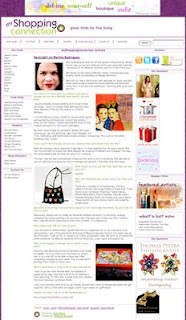 An interview she had done with me recently, for a designer spotlight, was just published. I think it turned out GREAT! I've never been interviewed for an article before and I AM SO HAPPY with the results. Please take a look and comment if you'd like! p.s. sorry for my mood swings...I think it is just one of those days.....!!! Well after my fabulous weekend and very busy week, I have a major summer cold. I don't do well when I'm sick. I feel totally sorry for myself. I need a PITTY PARTY!! Drinking tea and doing all the right things but feeling way, way, gloomy. Kind of like the fog outside today. Don't remember ever having a Summer cold before. Weird! I am feeling so pitiful!!! Yesterday was a gorgeous day in San Francisco. 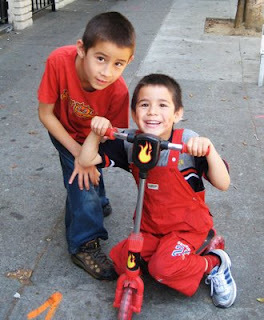 I got a call last week from Miriam at the Galeria de la Raza in the Mission asking if I wanted to participate as a vendor in their Sunday Streets event. It sounded like a great event so there I was along with some of San Francisco's finest. 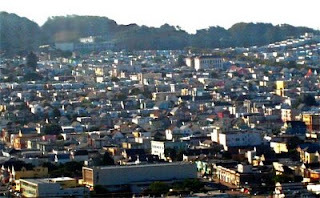 The Mission District, known as a predominantly Latino neighborhood is now also home to a hipster population. The two groups seem to tolerate each other and Sunday was a testimony to that. 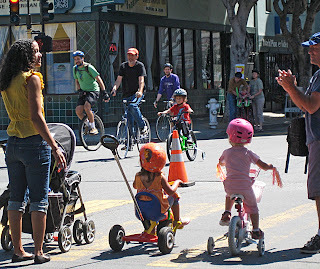 Diversity ruled for the day and my San Franciscan gente were out in full force: strolling, riding, eating visiting and shopping (thank-you!) too. What a fabulous day. 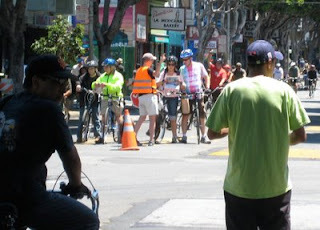 The old, young, geek, hipster, boomers and on and on could be seen strolling or riding down 24th Street. 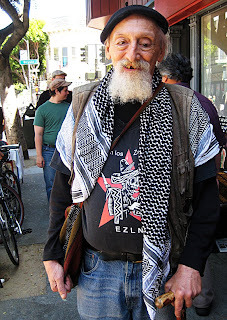 This is why I love living in San Francisco - we are an electic, unique group. I think that's what living life to the fullest should be about - letting go of the fear to be the unique person you are. 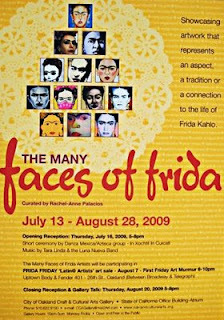 COME JOIN US TONIGHT FOR THE MANY FACES OF FRIDA OPENING! Put this together early this Wednesday morning. The Many Faces of Frida - opening!!! 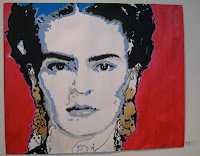 Just a reminder that the opening reception of The Many Faces of Frida is Thursday, July 16th. don't forget about the afterparty at somar bar immediately following the opening reception! Took this photo about a half-hour ago from my house window. 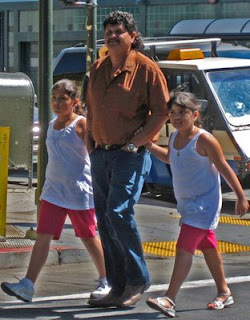 Its summer in San Francisco and its sunny! We've actually had some days of heat this summer (actually this year) and it seems obvious that the climate of our dear earth is warming. 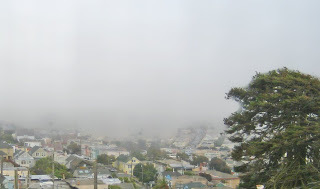 Summer in San Francisco is typically cold, foggy and rarely sunny. Having said all that, I will take advantage of the weather and go take some other pics. of my beautiful city. The many faces of Frida (http://www.facebook.com/home.php?ref=home#/event.php?eid=114306245389&ref=ts) opening is coming up on Thursday and I'm looking forward to seeing my work displayed plus the work of the other very talented artists! Since I just learned how to use the imac utility GRAB, here is a picture of the Satin Doll treasury. I love being selected to be in two treasuries and I love this imac application GRAB! Hey all. 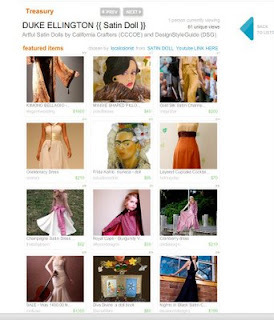 Unbelievable but I have a second etsy treasury happening. This one is called Latin Love. 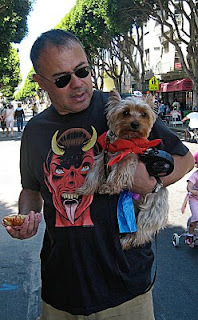 My "Two Wives of Diego" is spotlighted! Nancy says that Satin Doll was written in 1953 by Duke Ellington and Billy Strayhorn. The lyrics were written by Johnny Mercer. It has been performed by such notable singers as the late Frank Sinatra. Take a look at the Treasury. It's 1:17am and I'm still up. What am I doing? Just wanted to post a quick entry. Saturday with "las girls" was fabulous. Lots of laughter, lots of understanding, not always in agreement but still way okay. It is wonderful to have such long time friends who can still understand, tease and council each other. What a wild group we are. Couldn't get out of the house today...too much fun on Saturday?? Felt like just relaxing, reading and regrouping. The 3 R's. Husband went out with old friends to see the Richard Avedon exhibit at MOMA and that was just fine. So nice and quiet at home. Gaby (daughter) came home early from work (bad cold) but that was just a good excuse for me to lounge around with her. 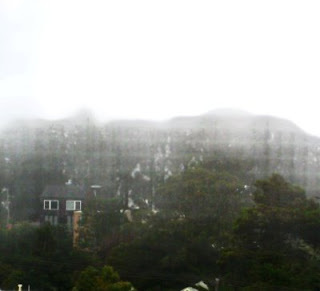 Woke up this morning to a foggy summer in San Francisco. For some reason, felt much improved. Tired of carrying around this funk, I listened to will.i.am's song Its A New Day and felt just a little bit revitalized. Going to an all girl barbeque this afternoon and looking forward to lots of laughter. Here's a link to Its A New Day. It may just make you feel good too! I took the photo above at the Women's Building on 18th St. in San Francisco. If you're not familiar with the building, it is covered with the most spectacular murals painted by several different artists. It is amazing to view. Sorry, I don't know the name of the artist who painted this particular piece. Its Friday and I should be happy? Unfortunately I haven't been into the studio much this week. Monday afternoon and probably today will be my only days. I find I feel incomplete if I don't spend enough time working in the studio. 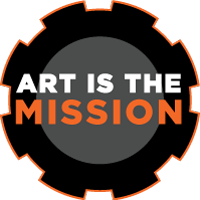 Creating has become an integral part of who I am and what I do. If I don't put in the time, something is missing. 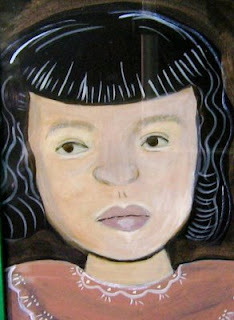 Delivered paintings and Frida dolls this week to Rachel for the Many Faces of Frida exhibit. Artwork looks great and looking forward to the opening next Thursday. Rachel does a fantastic job of creating luscious environments to showcase artwork. That girl is so talented. Sales have been non-existent in the past two months. Ooooooo what a challenge it has been to get through these times! Honestly trying not to take it all too personally and do believe that my work is good and sales will return when people can afford to pay for gift and personal items. I know my prices are higher than others but folks, I have overhead to pay. I can't afford to sell my work for prices that don't cover my expenses. What a dilemma. 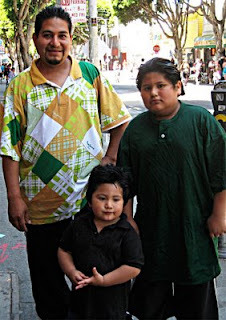 There was a death in my family and I attended the funeral in San Jose. The funeral was really beautiful with lots of singing and music. Cheo (my "uncle") would have loved the event and I'm sure would have loved to see all the familiar faces. He was always, always so sweet with a quick smile and full of positive energy. I loved seeing all the familiar faces plus my tias and primos and primas. My family has a wonderful way of facing life's challenges with quick wit and lots of laughter. I love being around my cousins, especially because I feel like my wacky humor runs in the family. We are irreverant, silly, slightly sarcastic and love to throw that Spanglish into the conversation!! Oh my God, it is so fun to be around them. I truly feel at home and one with my primos. It is a wonderful feeling! Saw the King Tut exhibit this week at the De Young. My daughter Gaby who is working there, had an invitation for family night so she brought me, my husband Gary and my friend Maryellen. 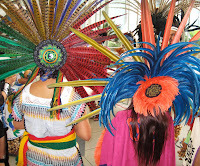 It was interesting, amazing, awe inspiring to view the artifacts from such a sophisticated culture living so long ago. I feel like I need to brush up on my history lessons. What I learned from the exhibit was just enough to wet my appetite! 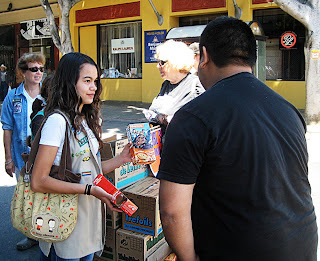 Afterwards, there were food and drinks available to employees and their families. What a special event. Tonight is the opening of the Richard Avedon exhibit. Gaby (she works at MOMA too) has gotten us tickets to the opening. I LOVE Richard Avedon but not so sure I feel like facing the crowds for opening tonight. Am I crazy or what for not being excited about this???? I'l figure it out. Feel like crawling into bed and not getting out! Will force myself out of this house and to the studio. Always feel better after working. This weekend is full of activities. Have an offical "girl's day barbeque" tomorrow which I am looking forward to. Lots of talk, lots of laughing. Very therapeutic!! Sunday have obligations which I am not ready for. Too many obligations this year. Managing to keep up with most but SO need to take a trip to New Orleans. Need to regroup, listen to my own voice without someone telling me what is the right thing to do. Sorry for the tirade. Need to make myself important again. Looking forward to a new week and starting over again! So while I'm going with this blogging business tonight, I thought I would include my addition in the IndieSpotting latest finds category. They included my Loteria Mirror which makes me so very happy. 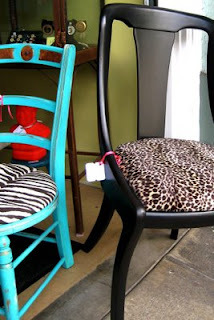 I am also including the link so you can check out all the other fabulous finds! 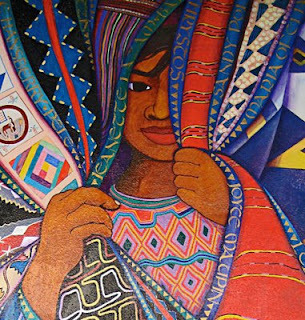 So one of my most favorite artistic / crafty chicas in the Bay Area, Rachel-Anne Palacios is curating a Frida Kahlo show in Oakland called "The Many Faces of Frida." 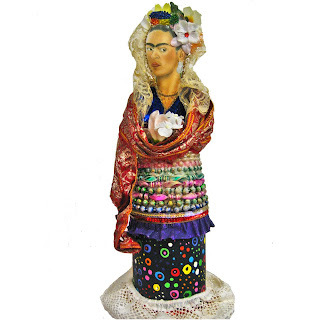 Rachel-Anne has selected the work of over 30 artists in California who have interpreted the likeness of Frida using their own particular talents. 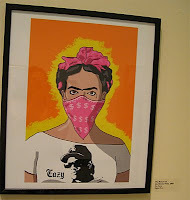 I'm included in this list of 30 and will have 3 mixed-media paintings on display plus 2 Frida dolls I created. The show is being held at the State of California Office Building Atrium in Oakland. Here are the details. If you live in the Bay Area or are visiting, please come to the opening. It should be fabulous! If you can't make it that night, stop by for a viewing. The show closes on August 28th. After putting off any attempts at blogging, I have finally broken down and joined the masses. Yes I Twitter, I'm on Facebook and have various others venues where I sell or try to sell my work. I started however to feel like was a walking advertisement on both Twitter and Facebook. Self-promotion is so important when you're an artist / craftsperson but I began to feel like an annoying commercial on both venues that keeps repeating itself. What to do? Well, if there are folks out there who enjoy my work and want to see pics of new items or hear about events I'm participating in, then this will be the place to find them. Don't get me wrong. I will still post on Twitter and Facebook, but perhaps not as much??? Let's just say I'm a work in progress and will be figuring this out. Have patience with me, please!